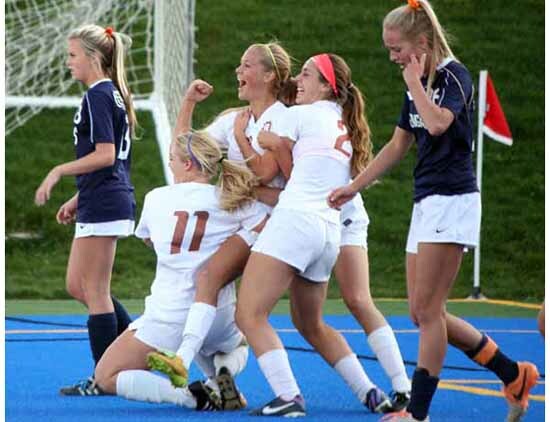 DRAPER – Ninety-nine and a half minutes of soccer was not enough to decide whether defending champion Brighton or powerhouse Davis would advance to the state championship game at Rio Tinto Stadium. Fortunately for the Darts, regulation and a pair of overtime periods provide 100 minutes before things get decided by a penalty kick shootout. 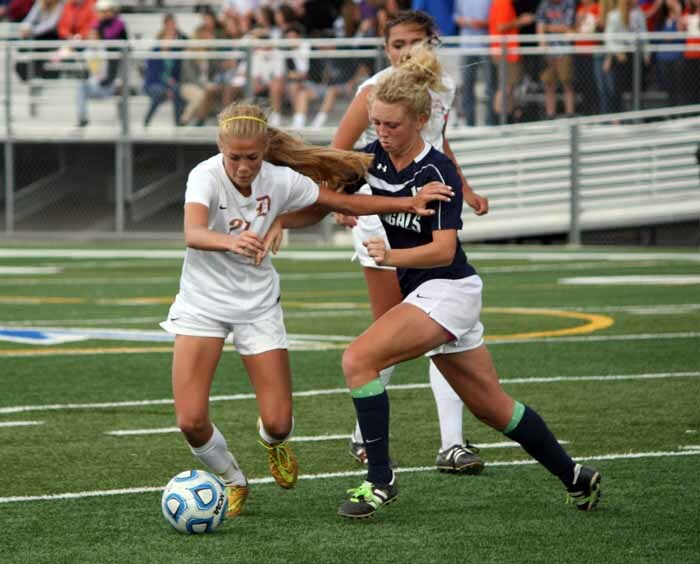 With the stadium clock showing just 12 seconds remaining in the second extra session Tuesday at Juan Diego Catholic High School, junior Ireland Dunn pushed the ball to her right to elude the Bengal defense. The Davis forward found what she was looking for as no Brighton defenders stepped to her and she was left with a great look at the right corner of the goal, from straight on, about 15 yards out. 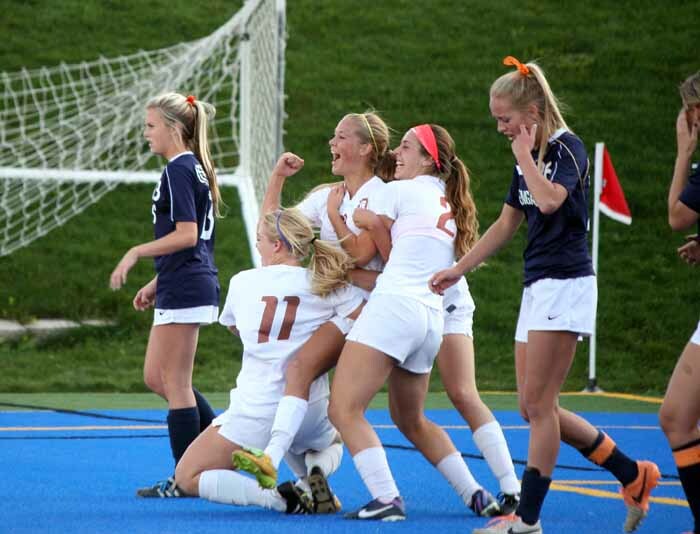 The goal gave the Darts a 2-1 double-overtime victory that eliminated the defending champs and sends Davis on to Rio Tinto to face unbeaten Lone Peak for the state championship Friday afternoon. During the first half of this contest, it certainly did not look like it would come down to the closing seconds of a second extra session. Davis controlled the pace of play and moved the ball extremely well during that opening stanza, but it only managed to find the inside of the frame once. That goal came early, in the ninth minute. Mackenzie Bell sent a long free kick from 50 yards out to the area just in front of the Brighton goal. The ball was misplayed, and waiting on the door step was a pair of Darts – Mikayla Colohan and Olivia Wade. The duo played the ball, and Wade was credited with the finish that provided the 1-0 lead. Wade, Colohan, Dunn and Madi Garlock were all extremely active throughout the first half, and that kept the Bengals from getting anything going. Davis maintained possession and played keep-away from Brighton, leaving the Bengals to try answering by way of the counter-attack. McKell Kellogg made great decisions in the center of the Brighton defense that helped keep the score at 1-0, and the Bengals managed to create some offense by getting the ball forward to Angie Timm, who was strong in possession of the ball to take some pressure off her team’s back line. That did not prevent Davis from getting into scoring position a number of times, however. The Darts hit the post twice, missed just wide on another occasion and had one point-blank shot turned away by goalkeeper Megan Turner. After all that, it was still a one-goal game at the break. The second half was very different than the first, as Timm and Rachel Powley turned up the aggression and created issues for the Davis defensive group. Even with the Bengals doing a better job of getting into the passing game, it was the Darts who had the better scoring chances even through most of the second stanza. It only took one really good one, however, for Brighton to even the match. That came in the 57th minute, as Kellogg hit a free kick from 45 yards out and dropped it neatly right in front of the goal, about six yards out. Raquel Watts was on the end of the drive and headed it past the goalie to tie the game at 1-1. As the second half of regulation play continued, Davis gained most of its best looks in transition, but on most of their ventures into the Bengals’ end, they ran into Kellogg, who sent the ball back the other way. Most of the Darts’ clearances from the back found the feet and heads of Brighton players and came right back at Davis. There were three times over the final 15 minutes of play in which Davis did get a free look at the goal, but all of the shots were off target. Once the teams got into extra time, Brighton turned even more aggressive, pushing its outside backs far into the Darts’ end of the pitch. That allowed the Bengals to push the envelope during the first five minutes of that period, but the next five minutes were played more in the Brighton defensive half. In the 87th minute, Dunn beat the Brighton defense and found her teammate, Wade, about 10 yards out in front with a nice feed. 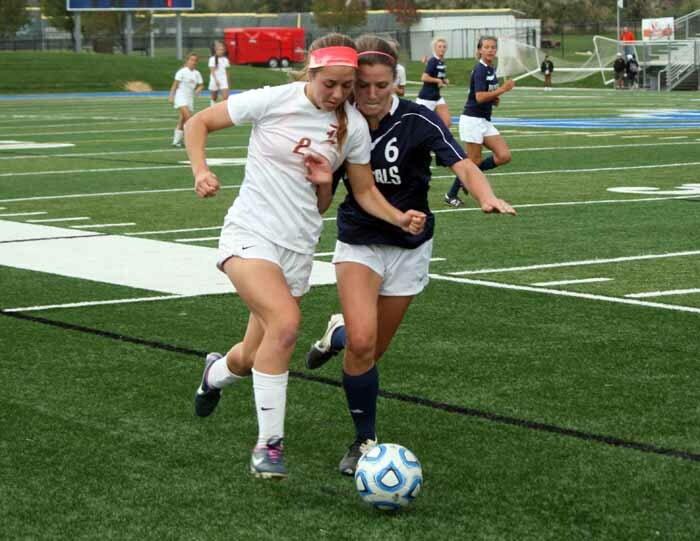 The ensuing shot was right at the keeper, and when Turner did not play it cleanly, it had to be cleared away by senior defender Katy Brinkerhoff. The second overtime went back and forth, as both teams put on the pressure and fell back to defend once they were unable to find a good shot, until Dunn found herself that little crack, in the 100th minute, and sent the Darts on to the state final at 4:30 p.m. Friday.